Speech and Language Therapy (SLT) provides treatment and support for those with communication difficulties but is also effective for providing care and advice for individuals struggling with eating, drinking or swallowing. SLT focuses on an individual’s ability to listen, understand the world around them, express their needs and maintain relationships. More than this, the technique works onspeech sounds, oral awareness and motor skills. In conjunction with parents, our therapists will decide the best communication method for each individual child. Our therapists apply a combination of standardised and non-standardised tests, across various settings, to offer a comprehensive assessment and clear picture of each child’s underlying skills and specific difficulties with communication. 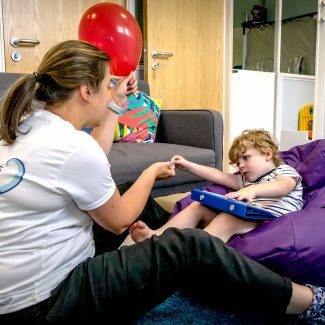 At The Ark Centre, we consider SLT to be an essential part of our Multidisciplinary Programmes and if this is selected as part of your child’s package, we apply 1 hour of direct SLT therapy per week. During this time, in every session our therapists will focus on your child’s specific SLT targets. We can also offer additional training, through Elklan and Hanen. What standardised and non-standardised tests will our therapists use? Note that, while standardised assessments are useful to highlighting a child’s individual strengths and weaknesses, speech and language assessments are standardised in a neuro-typical population and therefore should be considered with caution. If you would like more information about the Speech and Language Therapy services our team can provide, don’t hesitate to contact us.